Recently I got my first chiropractic adjustment for upper left side pain as it was radiating towards my heart, the doc stated rib 4,5,6 needs adjusting w/o x-ray. After the procedure, I now have tingling/numbness in my left thumb and index fingers. Is this anything to be concerned about? Ah, good, you have started a new thread. Was your neck also manipulated? If so, then yes there is reason for concern, and you should discuss this fully with your chiropractor before having another neck adjustment. Don't be brushed off, and if s/he doesn't take you seriously go elsewhere. More likely deep upper back pain often comes from the lower neck, and the tingling in your arm was going to begin anyway. A C4-C5-C6 subluxation often starts by radiating via the Dorsal Scapular nerve to exactly the area where you were feeling the pain. Diagnostically it's very difficult: is it a 4-5-6th rib, or is it radiating from the lower neck. Is it both? Or something else entirely. Rib problems do radiate along the rib to the front of the chest. But so do T1 and T2 subluxations. It's complicated! So it starts in the upper back and, with or without treatment, after a few days starts down the arm. 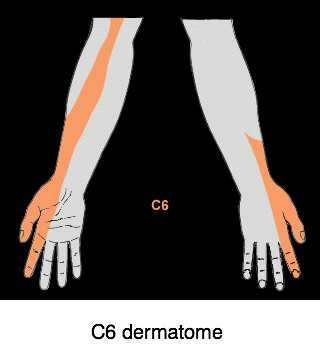 More usually the C5 dermatome in the upper arm, so with yours being in the C6 dermatome, careful evaluation is needed. We used to X-ray each and every case, just to rule out serious pathology which rarely cropped up. Now research shows that 7-8% of cancer is actually caused by X-rays, so I too only X-ray when it's clearly indicated. Which may now be the case. After chiropractic treatment pain isn't uncommon, just like after-having-your-wisdom-teeth-or-appendix-treatment-out-pain. But each and every case needs to be evaluated: should the treatment be changed, are X-rays necessary, or is this simply part of the process? Follow your gut feel, and especially whether your chiropractor just brushes over your concerns. They are real, what you feel is what you feel. S/he should understand that. Severe cases of chiropractic iatrogenic illness are very uncommon, but stresses and strains after the first few treatments of a chronic problem are certainly not uncommon at all. I hope this doesn't simply add to your confusion! I do hope this has contributed. If so, this is my latest book of chiropractic anecdotes, available on Amazon for $2.99! Shameless self promotion! Bats in my Belfry … light and healthful Chiropractic anecdotes from the Chiropractic Coalface.